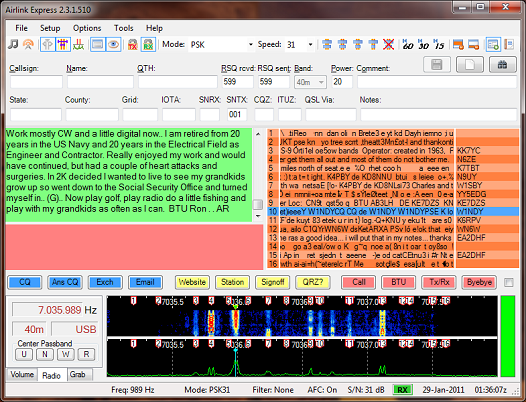 Airlink Express is a user friendly digital mode software package for the Amateur Radio Operator. The software is compatible with Microsoft Windows XP, Microsoft Windows Vista, Microsoft Windows 7, Microsoft Windows 10. It offers PSK, MFSK and RTTY digital modes with logging and macro capabilities. If you have ever used the Digipan software you will be immediately familiar with Airlink Express. With the release of Windows Vista and Windows 7, Microsoft introduced a new sound architecture. Airlink Express is developed to support this new sound architecture, yet it maintains complete backward compatibility with Windows XP. Airlink Express brings back the familiar volume slider interface you’ve become used to from older Windows versions. The DSP engine used in Airlink Express is MMVari by Makoto Mori, JE3HHT. This engine is very flexible and decodes as well, if not better, than any other soundcard mode engine currently available. It is used by many other software products like Logger32 and the N1MM contest logger. Row and cell selections work have been fixed in the logbook to align better with expectations. A continuously updated ADI file (C:\Users\YOUR_USERNAME_HERE\AppData\Local\Airlink Express\AirlinkExpress.adi) Every time you log a contact it will be added to this file. When you delete the file, a new one will be created the next time a contact is logged. MODE and SUBMODE to ADIF export to be compliant with ADIF v3.08. RX and TX volume sliders now continuously vary the level instead of only when you release the left mouse button. Moved directory for Exception Handler log to Data directory and added supported Windows versions.